DaveT 3D 2014 Show Reel from Dave Tanielu on Vimeo. Terminix "Swarm" I animated this swarm of trucks. This homepage takeover features a Ford Mustang barreling onto Yahoo's homepage, during which It transforms into 3 different cars. I was happy to hear that it won Yahoo's "Ad of the Year 2011." I was responsible for the animation and simulation of this transforming car. If you want to see the complete project breakdown click here. Check out the Aamco ad that made it into Shootonline's Fall 2014 Top Ten VFX & Animation Chart. I worked on the animation of this exploding transmission. GTA Crash 03 from Dave Tanielu on Vimeo. Grand Theft Auto: RISE - Live Action Short Film. I animated the car crashing into a concrete pole. If you want to see the film and a longer version of the behind the scenes Click Here. It was great to see a couple of the shots that i had worked on were selected to be in Autodesk's Animation Show Reel. 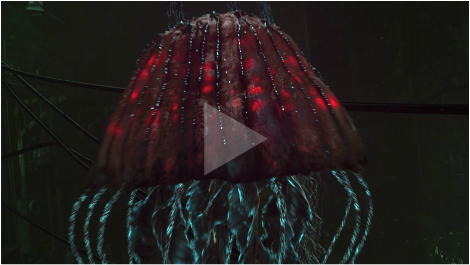 I Animated these jellyfish using traditional animation for the body and cloth simulation for the tentacles.